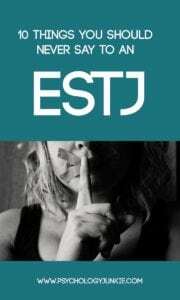 ESTJs are one of the more common Myers-Briggs® personality types. Making up 8.7% of the US population, they are known for their leadership skills, dedication, logical thinking, and practical know-how. These types tend to be confident and friendly, but also direct and honest. Chances are, you’ll come into contact with a number of ESTJs in your life, so what should you avoid saying to them? I spoke with as many ESTJs as I could find to put together this list of things NOT to say (or to say differently). ESTJs like to have a plan. In fact, they like to have contingency plans to back up their plans in case of a disaster. Being prepared is a hallmark of this personality type, and being spontaneous or just “winging it” tends to stress them out. ESTJs are known for seeing things in very black and white terms. They trust facts, empirical data, and rules they have tested through time and experience. They dislike “gray areas” and usually have very strong core values and morals. Moral ambiguity and rule-breaking can be very frustrating to them. ESTJs trust facts and logical data before they look inward to their emotions. They tend to distrust emotional decision making because it has the tendency to result in biases. As people who are extremely concerned with fairness and justice, ESTJs believe the safest way to be fair is to trust facts. ESTJs don’t see the point in complaining or airing one’s woes without seeking a solution. In their mind, if you have a problem and you’re bringing it to them, the most caring thing that they can do is provide practical advice. Unfortunately, this can backfire with types who just want affirmation. Timeliness and punctuality are important to ESTJs. When they make a commitment to a particular time, it’s disrespectful in their mind to show up late. Being on time and following through on commitments is one of the major ways that ESTJs show they care. ESTJs tend to enjoy a good-natured debate, but they rarely see it as a personal attack. They can get frustrated when people read into their skepticism or arguments and assume that there is personal malevolence at play. Having their questions and arguments stifled can irritate them or make them feel misunderstood. Because ESTJs have inferior Introverted Feeling, it can be difficult for them to express their deeper emotional feelings out loud. Being pressured to do so can make them feel out of their element. If you want them to discuss their emotions, it’s better not to push or prod them. Make yourself available and show that you are trustworthy and a good listener. Once that trust is established, the ESTJ will feel more comfortable turning to you if the need arises. ESTJs tend to distrust “hunches” or gut feelings. If you want to convince them of something, be sure you’ve done your homework! Show them the facts, the details, the proof. ESTJs strive to ensure that their decisions are as evidence-based and logical as possible. ESTJs are careful and prepared when they make a decision. They are usually very detail-oriented, logical, and methodical. If they’re doing something in a different way than you’d expect, it’d be better to ask them if they need some help or to ask them about their method rather than assume they don’t know what they’re doing. ESTJs are known for their hard-working nature. One of the biggest ways to tick them off is to be lazy or slow to act. Procrastinating, moaning and groaning your way through a project, or complaining the entire time is a sure way to irritate them. Making excuses for poor behavior or a poor work ethic is one of the worst things you can do in communication with an ESTJ. Do these statements bother you? Do you have any other thoughts to add? Let us know in the comments!